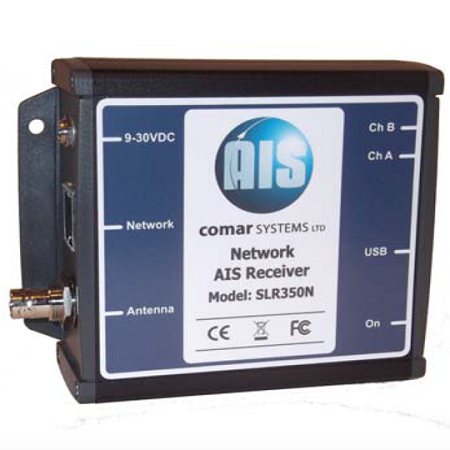 NOTE: The Comar SLR350N is now the Comar R400N Network AIS Receiver. Please visit the R400N page for more information and to order. The Comar SLR350N is a Network AIS Receiver for Coastal Monitoring Applications. Connected to a PC, via the industry standard RJ45 Ethernet connector, the SLR350N enables AIS data to be viewed directly, or shared on a local network. The unit can also be mounted at a remote location and AIS data sent via the Internet to a fixed IP address for use on a dedicated server. The SLR350N has been specifically designed for use by the professional market and uses the well proven and internationally specified Comar high sensitivity dual channel parallel receiver. Analysis of shipping in specific areas. A method of monitoring the position, speed and heading of AIS vessels within VHF range. Decoding of Class A, Class B, Aids to Navigation, SARTS and all other AIS message types. Designed to comply with IEC 61993-2. 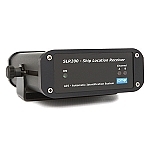 NOTE: The SLR-350N is a specialty AIS receiver intended for networked environments. Set-up and configuration of the SLR-350N requires a working knowledge of networking (TCP/IP, UDP, etc.). Limited set-up technical support can be provided. This product is not recommended for other than professional installations. "We are not aware if the unit is capable of transmitting data to two differing IP addresses we have never tested it in this situation. The COMAR 350N uses the DIGI International Ethernet module, ME-9210. A link is supplied below that gives all the information on what the module can do. You should be able to discern if the unit meets with your requirement, from this information. Another way some customers have accomplished what you are looking for is have the SLR350N remotely installed supplying info to a server at a different location and have that server do the multi-site and scripting work. A: Yes, the Comar SLR350N includes a power supply for 110-240vAC. Q: I would like to order 3 and I would like like to know that it can ship to Thailand? We accept only credit cards and PayPal for payment. A: The SLR350N might not be the right solution for this if you need wireless. Another easy way to do this would be to use for example an SR162 receiver with our WiFly wireless adaptor plugged into the serial port, pick up the wireless data on another computer (or join to another wireless router and access that way) and process the information via the remote computer. A: Yes, we can ship to Thailand. Just add to your shopping cart with your destination address and you will see options and prices for shipping.